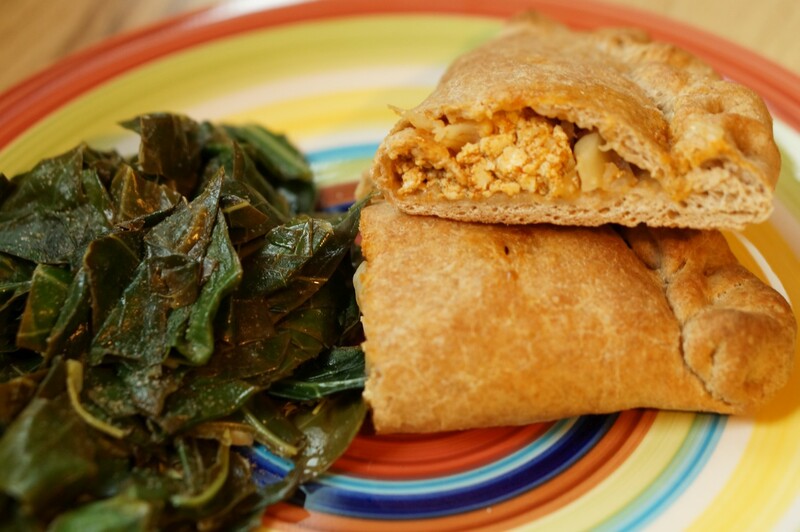 We recently made an Ethiopian feast for dinner and Darlene had the fabulous idea to turn the leftover tofu wat into hand pies (or calzones if you like). Every culture has some sort of hand pie, though I’m not sure if you’d find something like this in Ethiopia. Regardless, they were awesome! Check out one of our previous pizza posts for a link to and discussion of the dough recipe. I don’t have a recipe for the tofu wat because I made it up as I went along but Google it and you’ll get some ideas. You could really fill these with anything though. We had these hand pies with some beautiful collards from our Bellair Farm CSA. It’s so exciting to be starting off the CSA season again and we hope to showcase more of the beautiful produce we’ll be getting each week in our share. Our go-to method for collards is simply to chop a bunch of them into bite-sized pieces (removing any thick stems), then saute in a little olive oil for a few minutes. Then we add a minced clove of garlic, saute for another minute then add lemon juice. (The juice from half a lemon is about right for a large bunch of collards.) I also like to add a little sweetener – 1/2 teaspoon of agave or sugar does the trick.